Big Sur, California is home to some of the most beautiful and dramatic seaside scenery in all the world. We were absolutely blown away by the spectacular cliffside views of the coast in Big Sur, California. It is one of those incredible places that makes you feel so alive and in awe of the magnificence around you! It’s hard to describe that feeling, and the pictures really don’t do it justice. But we’ll take you along on our ride of the Scenic Drive in Big Sur in today’s post, in hopes to inspire you to get out there and witness it yourself. Enjoy! The stretch of road along CA-1 from Monterey to Pismo Beach seems to be something out of a fairy tale. Winding roads, rocky cliffs, and sprawling waves crashing below – it almost makes our hearts skip a beat just thinking about it. It is by far the prettiest scenery we’ve seen along any coastline. But if you’re not up for the full 3 ½ hour ride – plus all of the stops along the way to take in the fresh air, soak in the views, and maybe grab a bite to eat – we’d recommend the following shorter trip. Start out from Monterey and head south on CA-1. While driving along, the views to the west will make you want to go below the posted speed limit for perhaps the first time in your life. Don’t forget to take some time to pull over along the scenic drive – for once you aren’t hurrying to get somewhere. This time the ride is the destination! Hike among the wildflowers or just stop to listen to the sound of crashing waves. In about half an hour you’ll reach Bixby Bridge. Spanning across the Pacific, this bridge is worth the stop. Pull over on the right side of the road and snap of few camera shots for the photo albums, but don’t forget to look through your own eyes (and not the camera lens) while you’re at it! In another 45 minutes, you’ll reach McWay Falls. This is too spectacular – a waterfall that crashes over a cliff and into the ocean. The scenic point is surrounded by beautiful purple wildflowers and well worth the overall trip. Once you have had your fill of dramatic coastal beauty, begin heading back towards Monterey. If you timed it right, now is about right to stop at Nepenthe. Visit the Phoenix Shop and look at all the unique and unusual wares that they sell. Without a doubt though, fill your bellies at Nepenthe restaurant. With gorgeous scenic views at your tables and great food too, this is a great place to take a break from the road! We highly recommend the ambrosia burger – it is delicious! 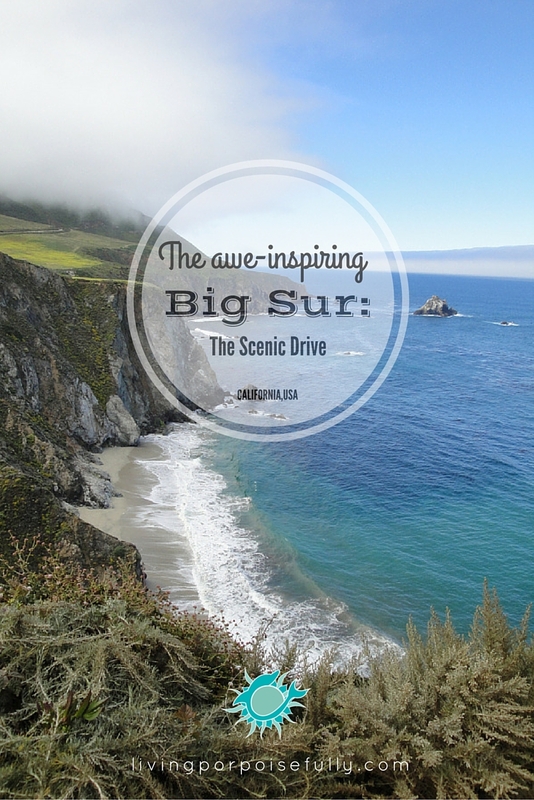 The Scenic Drive of Big Sur is more about taking in the incredible natural beauty of the scenery, and is the quintessential place to remind you that it is the journey, not the destination that makes life worth living! P.S. – Check out our Monterey Bay Top 5 post for more California goodness! Next Post Paintbrush Magic + SNEAK PEEK into Zale’s Tales!